I have known Jacqui, owner of CMYKlay on Etsy, for years. Ever since I've known her, and long before then, Jacqui has been a lover of art and all things mini. Back in July 2014 Jacqui decided that now that her daughter was a bit older she wanted to begin working again and thus CMYKlay was born! 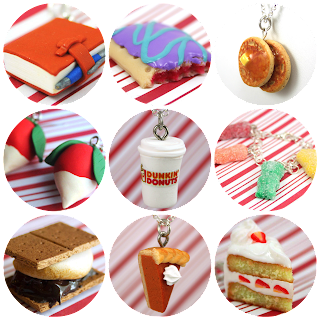 Home to 379 (and counting) polymer clay miniature jewelry - charms, necklaces, bracelets, and more - CMYKlay is the perfect shop to pick up a small trinket for any food lover! Seriously, how real do these look?! If I didn't know better, I would say that I did in fact take a bite out of that Thin Mint. 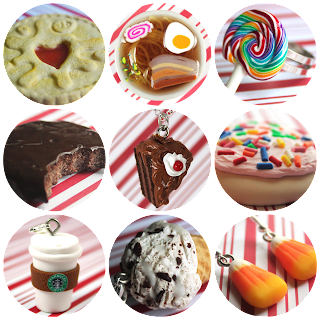 She has such an incredible variety you are bound to find a favorite amongst her miniatures for yourself or for a friend. And if you don't she does take custom orders. This crafty and exceptionally talented woman used to run CMYKakes - if you scroll through the photos on the Facebook page you can see the talent shining through (I take partial credit for the monkey rice krispie cake as that was requested by me lol) and though she doesn't make cakes anymore she refused to let her talent go to waste (my words, not hers). Enter her Wedding Cake Replicas. Absolutely stunning! It's one thing to make an ice cream cone or cookie replica, but a wedding cake? Honestly, Jacqui has truly outdone herself with these. 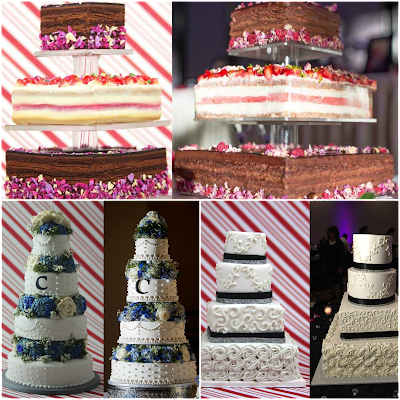 The wedding cakes do take a huge amount of effort on Jacqui's part, not that she doesn't love it, so each cake is a personal order and upon receiving a picture she will quote you a price. As she states her "background in cakes has made [her] a perfectionist and [she pays] very close attention to detail to get your cake as close to the original," which totally shows through in these replicas. 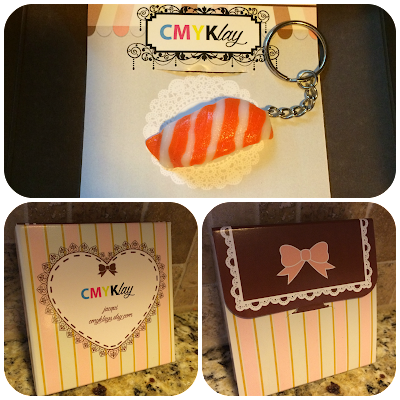 Jacqui was kind enough to send me my own sushi key chain to experience the wonder that is polymer clay miniature jewelry. 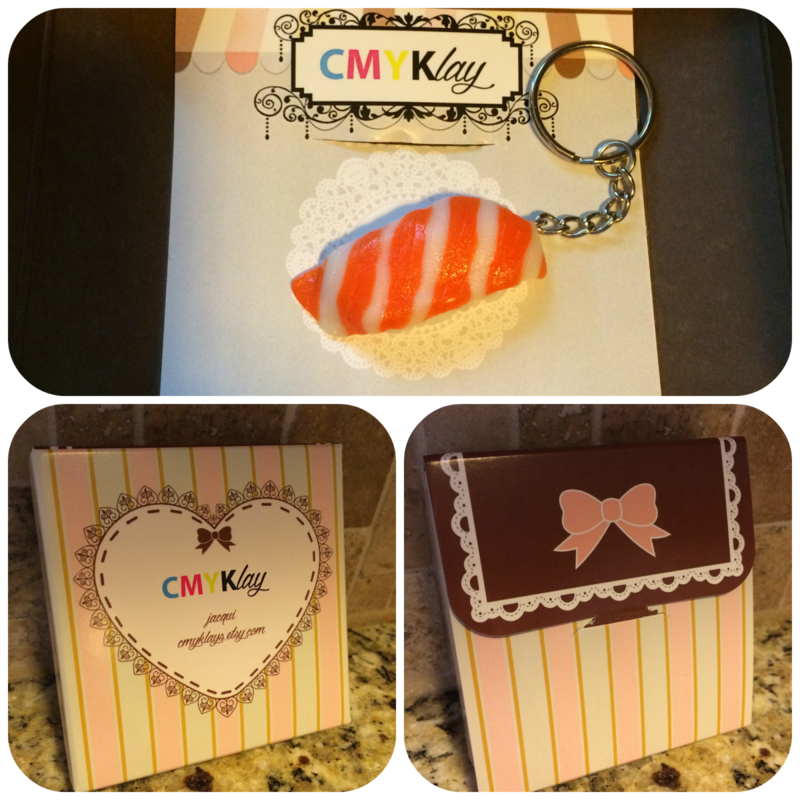 I loved Jacqui's shipping packaging: a bright teal envelope with hot pink tissue paper and a super cute box! The sushi key chain itself is perfect. I attached it to my keys immediately and even a week later, there isn't any wear and tear. I've gotten compliments on it as well - my keys just sit on my desk at work so when somebody stops by and sees it they say something. It's small, no bigger than my thumb, but durable and strong. The detail is amazing and there are even bits of rice on the side and bottom that add to the realism. My only issue with this is that every time I see it I instantly crave sushi! 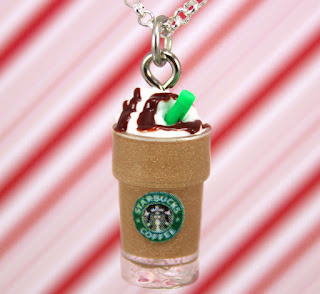 For one lucky winner, Jacqui is offering a Chocolate Drizzle Starbucks Frappe necklace (click here for more information)!